Hope and optimism are powerful forces forces that pave the way to change current day realities and go on to alter the course of history. These formidable forces fly seemingly uninhibited in the face of what is and drive us towards what could be. As our dental serve team has served this week in Haiti, we have found these forces waiting for us at every turn. Serving alongside our team of Haitian dental professionals and advanced dental students, our team was able to engage in serving the Haitian populations both in our permanent clinic and mobile dental clinic programs, providing care to 368 patients over the course of 4 days. I think of the many stories from this week. I think of the 7-year old girl who was afraid and embarrassed to smile because her teeth were mottled brown due to fluorosis from years of high-fluoride water intake. To see her look at her new smile in photos, teeth free of brown spots that caused her much shame, caused her face to begin to light up. 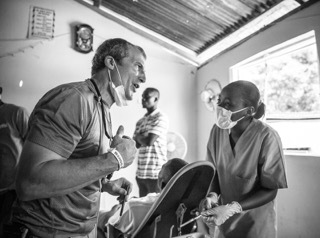 I think of the 5-year old boy with physical and mental handicaps whose entire upper row of teeth had rotted out and needed excellent care delivered by our team in a timely manner to stave off infection, restore health, and most importantly love him and care for him with the compassion of Christ Himself. On our last day of clinic, a 27-year old school teacher walked in to our mobile dental clinic expecting she needed to have multiple extractions due to the state of her teeth. Though she walked in defeated and ashamed, she walked out with a new smile. 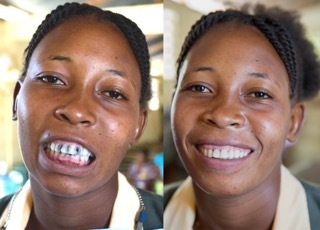 Our team was able to restore and save her teeth, providing her with an unprecedented confidence and hope. As she steps back into the classroom, she steps in more proud and sure of herself than ever before. She left beaming with pride! I think of those, and so many more. After an incredible life-giving experience, our team returns to the states with our hearts full knowing that we were part of bringing His Kingdom a bit closer to people this week in Haiti. Though we were able to bring health, joy, hope, and comfort to many, the greatest joy we have as a team is found in knowing that we are simply a part of a greater plan that is bigger than any one of us. We poured our lives out to further equip, empower, and encourage an entire team of Haitian dental professionals in the ongoing work of Hope Smiles that is the paradigm shift in dental care that they are leading for their country. They will carry the vision forward in the days and weeks to come. Our Haitian colleagues embody both hope and optimism. They are claiming the future for themselves and for His Kingdom rather than abandoning it to every rhyme and reason why a model of sustainable dental care led by Haitians to care for their country would never work. Others may have resigned; people may have given up long ago; Hope Smiles, and more over our team in Haiti, does not. We found hope and optimism in the many interactions and conversations we have had throughout the week with our partner organizations in Haiti who willfully come alongside of us to achieve the great mission that we have been given. Their words, their encouragement, their confidence, and their relentless dedication have all assured us as an organization that we are not crazy. Yes we have a great mission and a large vision before us to accomplish, but we will not be moved. We will see a new day of care in Haiti. We will succeed. Friends, our best days are yet ahead of us. Uganda Staff Member Marks Next Step in Her Career!